In the next legislative session Rep. La Shawn K. Ford will reintroduce legislation to count incarcerated people at home for redistricting purposes. The days of prison-based gerrymandering may be numbered in Illinois. “My bill, and the one passed by Maryland, represent state-based solutions to a long- standing problem in the federal Census. The federal census counts people in prison as residents of the prison location, even though they can’t vote and remain residents of their homes for all other legal purposes,” said Rep. La Shawn K. Ford (D-Chicago). The Illinois bill introduced by Rep. Ford, HB 94 made it all the way to a floor vote last year. Rep. Ford expects to re-introduce legislation in the next session of the Illinois General Assembly. New York, Delaware and California have already passed similar laws. Rep. Ford’s bill would adjust redistricting data to count incarcerated people where they live. The bill applies to state, county, and municipal redistricting data, ensuring that prison populations are not used to skew political power in state or local government. Such changes to redistricting data have no affect on the distribution of federal funds. “Representative Ford has been advocating for an end to prison-based gerrymandering long before the problem was on the national radar. The Supreme Court has given a green light to Rep. Ford’s bill to end prison-based gerrymandering in Illinois,” said Peter Wagner, Executive Director of the Prison Policy Initiative and the nation’s leading expert on how the Census Bureau’s practice of counting incarcerated people as residents of the prison locations harms the democratic process. Ending prison-based gerrymandering in Illinois would be beneficial to every resident who does not live next to a large prison, and Rep. Ford’s legislation has the support of a strong local coalition. With all the pieces in place, and with the support of the landmark Supreme Court decision, prospects look good for Illinois to join the growing list of states that have put an end to the practice of prison-based gerrymandering. Court rules that states can adjust redistricting data to better reflect their populations; now will Wisconsin end prison-based gerrymandering? 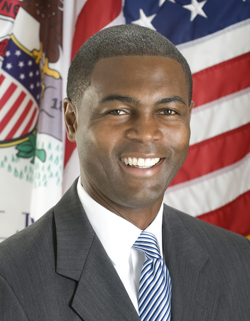 HB94 sponsored by Rep. Lashawn Ford, has passed out of committee and is before the full Illinois House. Jessica Pupovac of Illinois Issues covers Illinois efforts to end prison-based gerrymandering.